So wonder upon wonders, not only was I featured on food52.com on Thursday, but I am now a finalist in one of their contests! It’s really exciting, and I’m honored that out of 51 contestants, my dish was chosen as one of two finalists. For this week’s contests, Amanda and Merrill chose the “Your Best Brunch Eggs” and the “Your Best Way to Cook Greens”. I entered the greens contest with the Linguini with Breadcrumbs and Kale, featured here on September 3 in Carbo Loading. Voting ends early next week – I can’t wait to hear the results! But in the meantime, I’m in Rhinebeck, NY this weekend with my best friends from high school. It’s gorgeous out here and we’re staying on cute farm that has a B&B. We can’t wait for the breakfast! It’s sure to be a weekend of reminiscing and laughing, and of course, wine! More to come on that, but here’s a little something sweet to take you into the weekend. 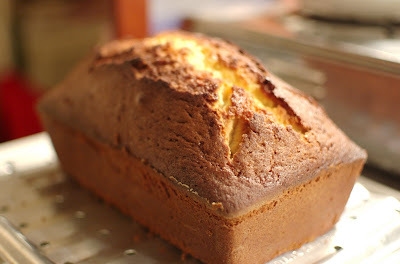 I made this delicious pound cake earlier this week and even brought in the leftovers for my co-workers – it was a hit! 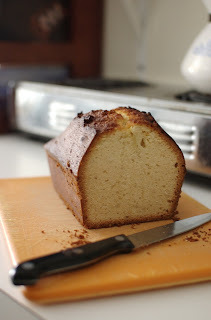 This cake was dense (in a good way!) and fragrant - the hints of lemon and honey were perfect and the texture reminded me of a denser French madeleine. Plus, it’s from Ina Garten’s Back to Basics, a cookbook that is quickly becoming a standard here at HC! Preheat the oven to 350 degrees. Grease and flour an 8 1/2 by 4 1/2 by 2 1/2-inch loaf pan. Cream the butter and sugar on medium speed for 3 to 4 minutes. (I found it best to do this with a wooden spoon). Meanwhile, put the eggs, honey, vanilla, and lemon zest in a separate bowl. With the mixer on medium-low speed, add the egg mixture, one egg at a time, scraping down the bowl and allowing each egg to become incorporated before adding the next egg. Wisk together the flour, salt, and baking powder. With the mixer on low speed, add it very slowly to the butter and egg mixture until just combined. Finish mixing the batter with a rubber spatula and pour it into the prepared pan. Smooth the top. Bake for 50 to 60 minutes, until a toothpick inserted in the center comes out clean. (In the toaster oven, it was about 75 minutes. I made sure to check it every few minutes until it was done). Cool for 15 minutes, turn out on a baking rack, and cool completely. Food 52 Cookbook, Here I Come! Adding Fuel to the Fire!